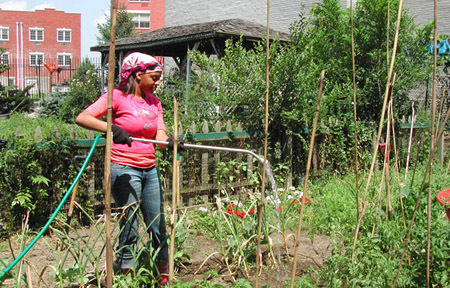 How a small urban farm is helping one community eat well without leaving the neighborhood. Along Third Avenue in the center of the South Bronx, the street is filled with McDonald’s and commercial fried chicken joints that fit neatly among rows of low-income apartments. Though the fast-food enterprise rakes in billions of dollars each year in the U.S., it has a particularly overwhelming presence in poor communities such as the South Bronx. The neighborhood boasts the highest rates of asthma and diabetes in the city, according to the city Department of Health’s 2006 Vital Statistics Summary. Growing up on greasy hamburgers and high-fructose soft drinks, residents often find themselves with little understanding of healthy eating and where to find better options. Just around the corner, on 165th Street and Boston Road, there is something surprising for this area: A once abandoned lot overwhelmed by rubbish and drug dealers has been converted into a community garden called the Jacqueline Denise Davis Garden, or the JDD. This community garden is part of an initiative called Learn it, Grow it, Eat it, started in 2006 and funded by the Council on the Environment of New York City to educate teens about their health and their community. “Community gardens are becoming a trend,” says David Saphire, the project coordinator of Learn it, Grow it, Eat it, or LGE. The venture was partially based on other urban farms that have experienced great success, such as Added Value in Red Hook, Brooklyn and East New York Farms in East Brooklyn. While there are over 600 community gardens in New York City alone, Saphire says that LGE is one of the only initiatives that incorporates health education in high schools. The JDD, Wishing Well Community and the Model T gardens in the Bronx are all part of LGE. In Saphire’s office, on the opposite end of New York City, located just across the street from City Hall, he explains how the idea developed. Saphire was teaching a nutritional program in local high schools in the South Bronx, touting healthy alternatives to the common fast-food pitfalls. Saphire, a self-educated nutrition guru who has been an environmental educator and researcher for the last 10 years, is a thin man, one who looks like he practices what he preaches. Working in the South Bronx, it didn’t take long for Saphire to notice a gap between what he was teaching in his nutrition lessons and what foods were readily available to his students. The solution Saphire proposed: Teach the kids about healthy alternatives by having them grow their own fruits and vegetables. And, as an added bonus, make it free. Saphire, in collaboration with Lenny Librizzi, assistant director of the Open Space Greening Program in New York City, ran with the idea and started what is often called an urban farm. Urban farming focuses on creating gardens in which neighborhood residents plant organic food on unused plots of land in the city. They donate or sell the food to other community members while also enhancing the beauty and value of the land. Making students an active part of their community allows them to see that they can make changes to their streets. “To me this project is a community gardening project,” says Librizzi who prefers to use this phrase. “Urban farming could be done by one person. Community is the operative word here. The community is working together to accomplish something together.” And that is what Saphire and Librizzi hope to build through their crusade for healthy eating—an enhanced sense of community. In the classroom, Saphire teaches his students the importance of reading labels on food they eat from the corner bodega or a fast-food restaurant. By paying attention to the nutritional content, often for the first time, the teens are shocked by the kinds of processed ingredients they regularly put in their bodies. Saphire devotes lessons to freshness and pesticide issues with foods that are not locally grown. He also talks about energy issues involved in producing and transporting produce hundreds of miles across the country. “I try to break this down to plain language and everyday eating,” he says. Saphire hopes that he is broadening his students’ awareness of what they eat and where and how to seek healthier options. While the kids don’t necessarily abandon unhealthy options, Saphire’s lessons are having some impact. One exercise has them measuring out the quantity of sugar (10 teaspoons of sugar or the entire daily recommended amount of calories from sugar) in a typical 12-ounce can of Coca-Cola. For the teenagers, the program not only offers an education in eating well, but also offers job opportunities. After extensive time in the classroom, Saphire and Librizzi train the students in the garden. During the school year, seven students from Bronx International High School spend five hours each week for school credit, maintaining the garden during the winter months and prepping it for summer crops as the weather gets warmer. As a visitor enters the gate to the JDD garden, there is an unused children’s play area, with a slide and a climbing block. Off to the side, there is a picnic area with several benches and tables, covered by a wooden construction that can shield picnickers from the rain. Seven high school students and Saphire and Librizzi are tending the 14,000-square-foot space. The land is mostly just soil now, but by summer the garden will be teeming with fresh produce. During the summer, interns work 24 hours a week and are paid $9-per-hour. They plant a variety of vegetables including tomatoes, squash and zucchini to eat themselves, bring home to their families or donate to food pantries and soup kitchens. hey lenny, we want a rainwater catchment system in our garden! This is great. It’s wonderful to see young people getting hip to this. It’s amazing what you can do with pots on a stoop, secured window boxes, small plot, etc. You CAN grow greens, small tomatoes, peppers. It’s rewarding and healthier food.for you. Kudos to those who set this up. We need more of these. water melons…marigolds, and the fiction from a neighboring gardener is that I can still plant and harvest spinache. I feel well. Hello. I was a teacher at HLR up the street 5 years ago. I planted a few apple trees in this garden. I am wanting to know if there are apples this year? Are they fruiting? Did they survive? I would love a photo.